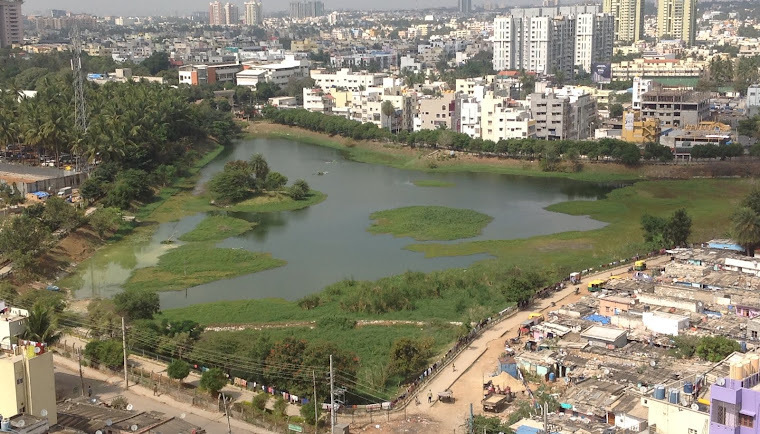 Those familiar with Puttenahalli Lake will know that one end of the lake, towards L&T South City has 100-odd shanty/ semi-pucca/ pucca houses (generally referred to as the encroachment "slum"), relocation pending since the last few years. 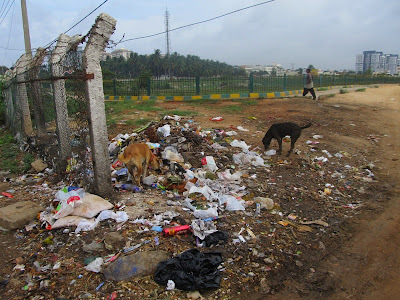 With human habitation there is garbage, and with no proper garbage collection mechanism in place, this end of the lake has always been messy and very difficult to keep clean. Other neighbourhood people have been adding to the mess by throwing their rubbish at the lake entrance. 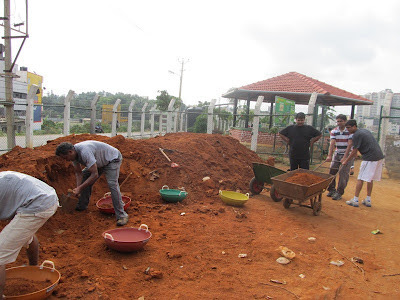 Now we don't know for how long the residents will live in the embankment but as long as they are there if they keep the lake and its environs clean, PNLIT's work as citizen caretakers of the lake will become that much easier. Over the last one month we have stepped up our effort to stop people from throwing garbage at the South City lake entrance. The residents started taking us a little seriously and last week about 50 of the slum dwellers led by the popularly called Swamiji of the nearby temple, cleaned up the revetment along the stretch facing their houses. Our gardener Kumara heard the Swamiji reprimanding them about the filth around where they lived and told them that they should be ashamed to see others from far away coming there to clean up their mess. BBMP has been kept informed of our attempt to clean the area and and they have said that they will send their garbage collection vehicle regularly. 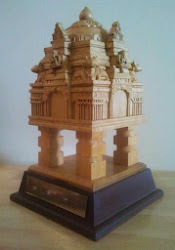 The Environment Engineer from BBMP, Ms.Vijayamala has been very supportive. This morning, along with a garbage collection vehicle she also sent 5 workers to clear out the trash from the entrance and the drain. The piles of garbage had compacted and the poor men kept digging endlessly. The stench was unbearable, to say the least. It is terrible to think that our reluctance to handle our waste makes life miserable for people like Sivanna and Sekhar. We got them to sprinkle bleaching powder to disinfect the area. We will need to put fresh soil and plant some flowering shrubs there to overcome the stink. Ganesh, one of the slum residents who has a shop outside the lake said he will get the slum residents to clear out the rubble that still remains so that the area is totally cleaned up. We are looking at enclosing the cleaned area and giving the responsibility of maintaining this small patch of plants to the slum residents. The BBMP (Lakes wing) has promised to cover at least part of the drain with concrete slabs. We have placed a 220 litre plastic drum with lid for the slum residents to throw in their garbage. We have also posted a banner prohibiting throwing garbage near the entrance. 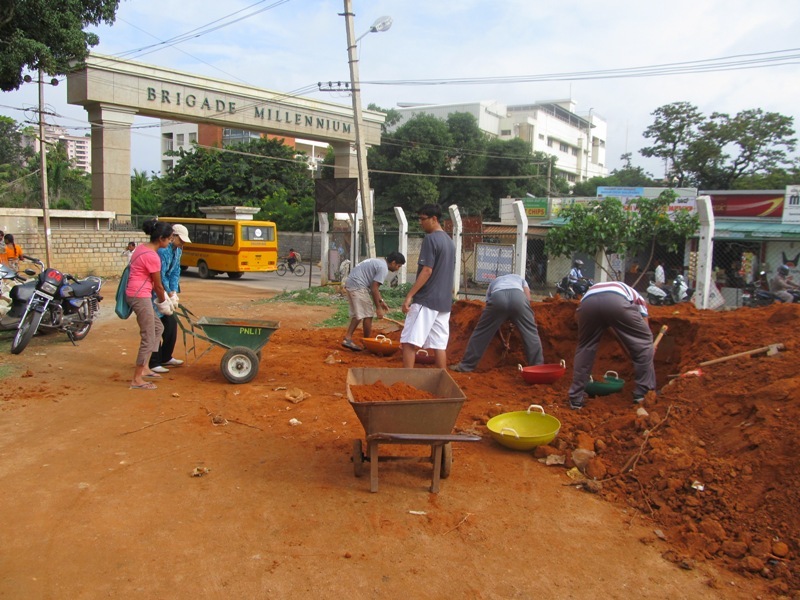 We, BBMP and PNLIT, have done our bit together. We hope the slum residents will understand and take the trouble to use the bin properly. If they do, the entrance will remain clean and the number of stray dogs would go down. The dogs carrying waste to the lake or chasing the birds would also reduce. In due course, we hope to get them to segregate their garbage and compost their degradable waste which will greatly reduce the waste to be disposed and produce manure for use at the lake. A request to people from the area - whenever/if you see anyone throwing trash at the entrance or randomly, please tell them to throw it in the bin. Only with such repeated reminders will we be able to get them to keep the area clean. 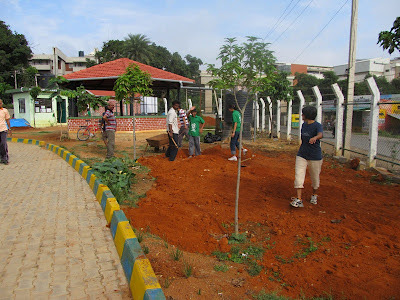 While cleaning up was happening by BBMP and residents of the hutments at the South City end, sprucing up was happening at the other end near the Millennium arch. A group of volunteers from the area folded up their sleeves to clear up the place near the gazebo and lay out fresh soil to make plant beds. It was most heartening to see some of the morning walkers join in, help for some time, and quietly leave. 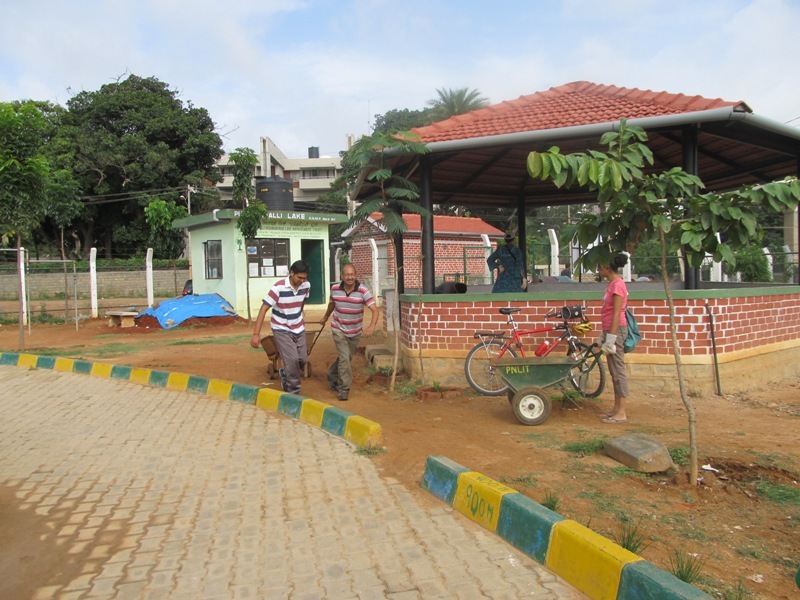 A big surprise was a gentleman who cycled in, smiled, introduced himself as Pankaj Dugar and said he had come to help. When asked where he cycled from he casually said Whitefield! Work continues next weekend. Join in if you can! Wow ! cycling from Whitefield to Puttenahalli Lake ! ? So Proud of you Pankaj ! Keep up the good work.